“When I first moved to my new flat in a new town I was quite lonely. John one of my support workers was coming to see me on a bike. I said I would like to ride a bike, I tried but I couldn’t balance. Tony is typical of many people that Holywell Care Services Support; he expressed an interest to his support staff and they found a way to make it happen through local knowledge and shared interests. 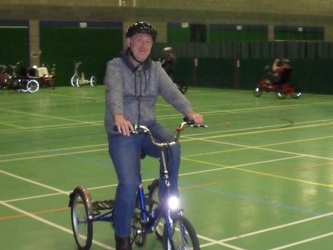 Tony enjoys his cycling and now attends sessions every week, and it is great to see him ride past staff with a big grin on his face.